I’m going to be honest, when I think hanging plants, I think the back porch of my Magoo’s house (Grandma, not a code name, that’s what she goes by — to me at least) brightly colored flowers in plastic containers, possibly with little clay racoons hanging off the side and next to the outdoor freezer holding the Holy Grail of popsicles. In other words, not me. That was, however, until I came across a cow silhouette plant hanger from Cowgirl Crush. And well I slipped, tripped and fell head-over-heels for it. With a couple clicks of my mouse, I snagged one of the last available cow silhouette hangers and clapped my hands excitedly from my work office. To make things even better, on a Sunday afternoon trip to SAM’s, mom decides to purchase both my sister and I a cute little flower arrangement of our choice for our homes. My sister, picks out a respectable and very pretty porch planter …and I made a beeline to the hanging plants. Looking at me strangely, she asked if I was planning on transplanting them. “Nope!” I said. “I have something to hang them on.” Cue even stranger look from my mother. Haters gonna hate, I’m rockin’ the hanging plant. Excuse the iPhone photo, it’s all I had on hand. Since installing mine, I’ve come across several other 20-somethings with similar displays of suspended flower prettiness. So in conclusion, hanging plants are the new black. So cute! Do they make horse ones?! I have a hanging airplane plant that could use some style (my mom forced me to take it…..somehow its still alive a year later). Whop! Whop! For the 20-something women that put out hanging annual flower baskets! When I was growing up we would buy a few annual flowers to put in a few planters (never hanging baskets), but primarily everything on our farm were perennials. I don’t know why, but for the past five years I have always put out a couple hanging flower baskets. I think they look nice and just add a little something to our front porch. I also bring my hanging flower baskets out to both of my husband’s late grandmother’s graves for the week of Memorial Day. Thanks for the blog S/O! 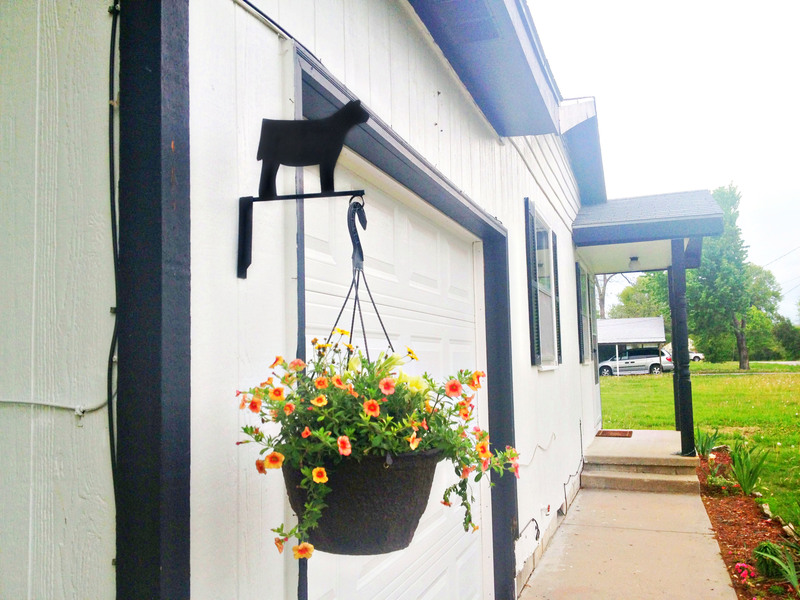 Love it and glad you love your Cattle Flower Pot Hanger! This is so cute! I am going to have to keep my eye out for a restock!